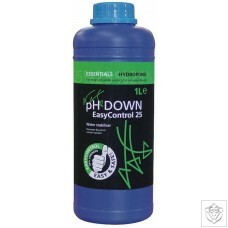 ESSENTIALS pH Down 1L (81% Phosphoric Acid) is a quality adjuster necessary to control the pH of nutrient solutions. Concentrated for the professional grower. 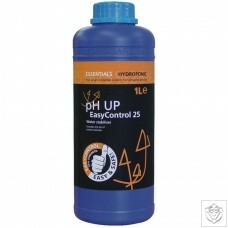 ..
Due to concerns over safety, we have reformulated our pH adjusters to a 25% strength and called them 'EASYCONTROL 25'. This means that it is easier to use for novice growers as there is less chance of overdosing. There is a reduced price and it is safer to handle. Quality adjusters are necessary to control the pH of nutrient solutions. 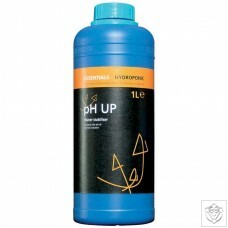 ..
ESSENTIALS pH Up 1L (50% Potassium Hydroxide) is a quality adjuster necessary to control the pH of nutrient solutions. Concentrated for the professional grower. 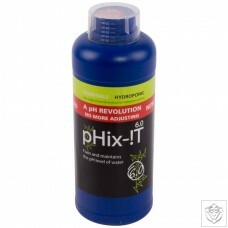 ..
ESSENTIALS pHix-!T 1L is a pH buffer. 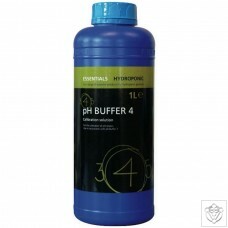 It is a blend of inorganic salts that fix and maintain the pH level of liquid to approximately 6.0 for up to 7-10 days. This product is best used when plants are established in a hydroponics system and growing vigorously. ..
Silicon+ produces a stronger plant by enhancing cell structure and also aids the development of root systems. 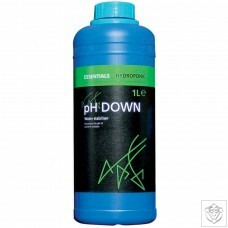 The high pH of ESSENTIALS Silicon+ enables the product to be used as pH Up in hydroponic systems. ..
Nutrient temperature measurement is via a thin waterproof probe. 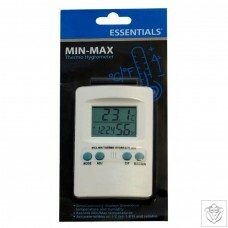 The Min/Max memory records the highest and lowest temperature values. Can display in °F or °C. ..
At the push of a button, it will display the highest and lowest values recorded since the unit was last reset. Can display in °F or °C. .. 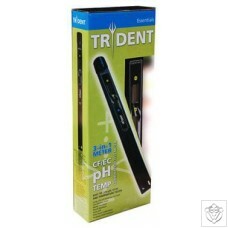 Essential Trident - pH, EC/CF and Temp Meter - Highly accurate, professional all-in-one meter for easy nutrient control The all-in-one conductivity, pH and temperature meter is designed to make nutrient measurement quick and easy. It can be used as a stirrer and makes it easier to take readings in deep tanks. Accurate and rapid conductivity, pH and temperature measurement - Nutrient strength in EC, CF or PPM - Easy push button calibration - Auto turn-off to preserve batteries - Supplied with long life AA batteries - Low battery indicator - Temperature compensation - Replaceable probe housing. 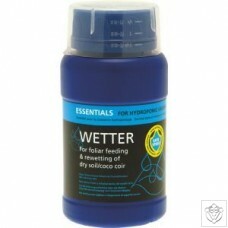 ..
Wetting Agent reduces the surface tension of water. Add to any foliar feed to greatly assist in the penetration of the leaf tissue enhancing the uptake of the feed. Also used on dry compacted soil to allow water penetration to the root zone. .. The Essentials EC meter gives direct accurate readings of nutrient solution and is very helpful in mixing nutrient concentrate with water. 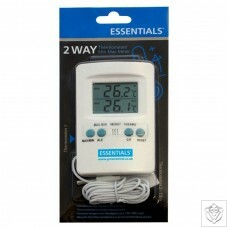 All readings are automatically temperature compensated. Easy to use, just dip the sensor into test solution, stir and wait. The unit will deliver a stable reading in about 20 seconds. .. Probes are replaceable so when your pH probe starts to go and your readings become erratic, don't go to the expense of buying a new meter, simply buy a replacement probe! .. 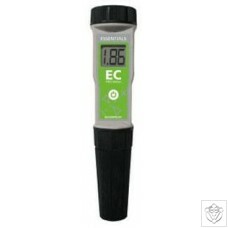 The ESSENTIALS pH Pro & EC Pro meters are professional quality, reliable and available with replacement probes. They have a large screen to view results and are very easy to use. They have screw calibration and come with a built in small screw driver. A feature that many customers have been asking us for. The meters have a lifespan of about 1 to 3 years depending on rate of sampling. (Units are good for 365 accurate tests.) These meters are some of the most robust in the market. They are fully waterproof and drop proof. To really push it we released the seal and held the meter under water for several minutes to allow water..
Use ESSENTIALS calibration solutions to calibrate EC/CF meters. 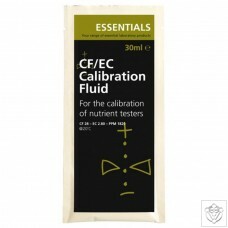 CF Standard now makes it easier for you to calibrate as it is set to read CF28 at 20 degrees (room temperature). 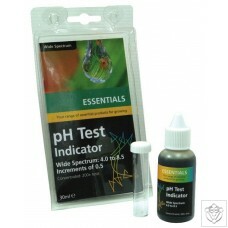 ..
Our ESSENTIALS pH Test Kit is good for 150 tests. At a rate of 3 tests per week, it will last one year. This makes it excellent value for money. Covers a pH range of 5.6-7.4 measuring in 0.2 increments. 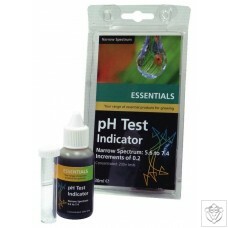 ..
Our ESSENTIALS pH Test Kit is good for 150 tests. At a rate of 3 tests per week, it will last one year. This makes it excellent value for money. Covers a pH range of 4-8.5 measuring in 0.5 increments. .. 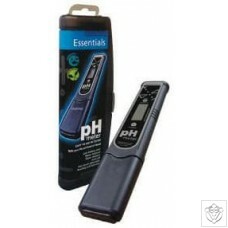 The Essentials pH meter is truly the most rugged glass type pH tester around. It is water and drop resistant. Easy to use, just dip the sensor into test solution, stir and wait. The unit will deliver a stable reading in about 20 seconds. .. It's difficult to exaggerate the importance of maintenance and storage solutions. Expensive equipment is often utilised well below its full capabilities due to lack of proper maintenance of sensors. pH probes should always remain in Meter Store when not in use to prevent the probe from drying out. 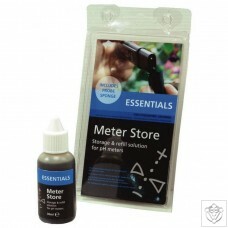 With Essentials Meter Store, keeping pH probes in tip top condition is no longer a problem. 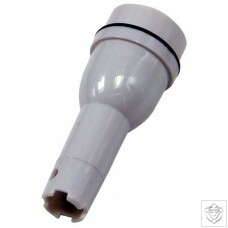 Includes probe foam to cut to the size of your meter cap to assist in keeping the probe wet. 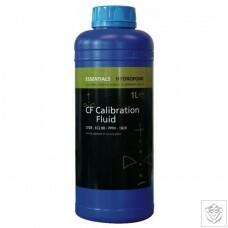 ..
Use ESSENTIALS Buffer 4 solutions to calibrate pH meters. All calibration solutions should be at room temperature for successful and accurate calibration. ..
Use ESSENTIALS Buffer 7 solutions to calibrate pH meters. All calibration solutions should be at room temperature for successful and accurate calibration. ..